CHICAGO—In a world run by a man with skin as orange as a hazmat suit, and a sidekick as terrifying as a broken condom, GayCo has managed to dismantle the alt-right movement in 3 simple keystrokes: CNTRL + ALT-RIGHT + DELETE. GayCo is back with a brand new show to take down the alt-right movement in a battle of sass, wit and sexual innuendos. So make like Jehovah and be a witness to our latest revue! Through scenes and songs, CNTRL + ALT-RIGHT + DELETE explores queer culture through explosive scenes like a lesbian seagull dream ballet, the not-so-sane lengths we go for love, a world where being straight means you’re the odd one out, to a nana whose rigor mortis is a little more active than most dead folks’. 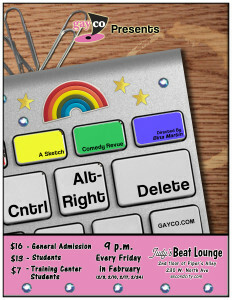 CNTRL + ALT-RIGHT + DELETE runs Fridays in February at Judy’s Beat Lounge (Piper’s Alley, 230 W. North Ave) at 9 PM. Tickets are $16 ($13 for students and $7 for Second City Training Center students) and can be purchased by calling 312-337-3992, or clicking HERE. CNTRL + ALT-RIGHT + DELETE stars Jessica Belless, Kathy Betts, Casey Coppess, Lanny Fox, Holly Lambert, Christopher Thies Lotito, Riley Mondgragon, and Katie Perry; with Greg Phelps and Sami Wolf as understudies. Directed by Bina Martin and assistant directed by Julia Bondani; with Amanda Murphy as musical director. Please help us honor the late, great founding member of GayCo Judy Fabjance by joining us for our first sketch review in Judy’s Beat Lounge.